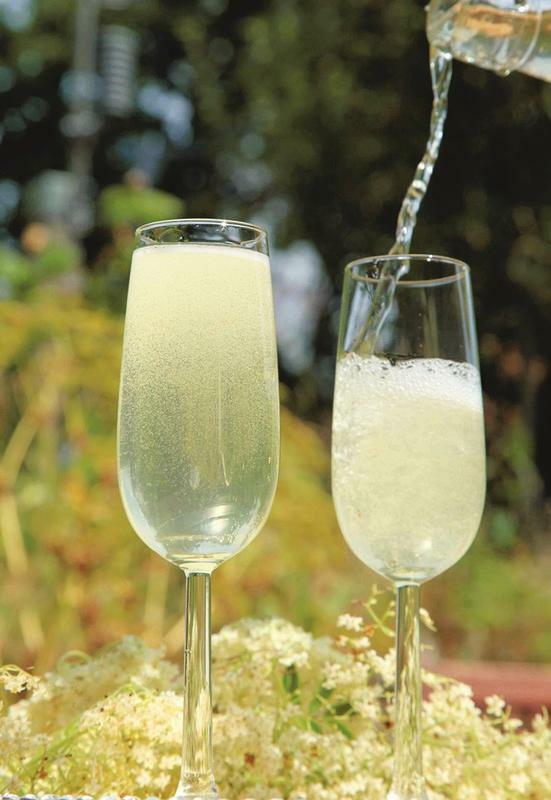 Quick and reckless recipe: This method for making sparkling elderflower is the one that can result in all that collateral damage, but it is very straightforward. John has enjoyed two-year-old elderflower sparkly made this way, so even though it is rough and ready it can keep quite well. Whenever you drink it, serve it chilled and pour carefully - there will be some sediment at the bottom of the bottle from the continued fermentation. Dissolve the sugar in 2 litres hot water in a fermenting bucket, then top up with 3 litres cold water. Allow to cool. Aerate and add the elderflower florets, lemon zest and juice and the yeast nutrient. Pitch the yeast or, if you like a bit of excitement, don't. Elderflowers come ready stocked with wild yeasts and it can be interesting to see how things turn out. If you did not add yeast and fermentation has not started after 3 days then it is time to give the thing a kick-start with a packet of Champagne yeast. After 6 days of fermentation, strain the must through boiled muslin into a fresh fermenting bucket, leaving the lees behind. Cover the bucket and leave for a few hours for the dust to settle, then siphon into your bottles of choice. Your sparkly is about ready to drink after a week, and in any case a week is a good time to check to see how things are going. You can release a little excess pressure by easing the lid off, though as noted this is a little tricky if you have used Champagne bottles. If you are still worried then put the lot in the fridge to stop the yeast making any more carbon dioxide and drink it as quickly as you can.